Hi friends! Hope everyone had a happy, happy New Year!! I had a wonderful weekend, celebrating with good friends, being lazy and getting some projects done around the house. In honor of the new year, I decided to do some updating of the closet in our master bedroom. As all of you know, David and I live in a 1952 ranch. and air system, and no walk-in closets! Eek! 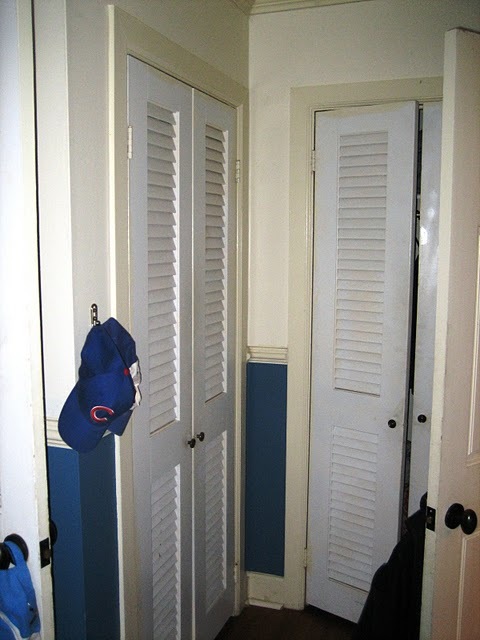 In addition to the fact that it's an older home, we actually decided to take over a room the former owner of the home used as a little boys room (you can read about that transformation here), so all we inherited closet-wise was a teeny tiny closet that was not in good shape. Much different from our former house, which had a walk-in closet big enough to call a bedroom itself. Lets start at the beginning: this is how our closet looked before we moved in. due to its odd "L" shape. So, our first step (in fact, one of the first once we moved in!) was to remove both closet doors. This instantly made the space a lot more open and accessible. 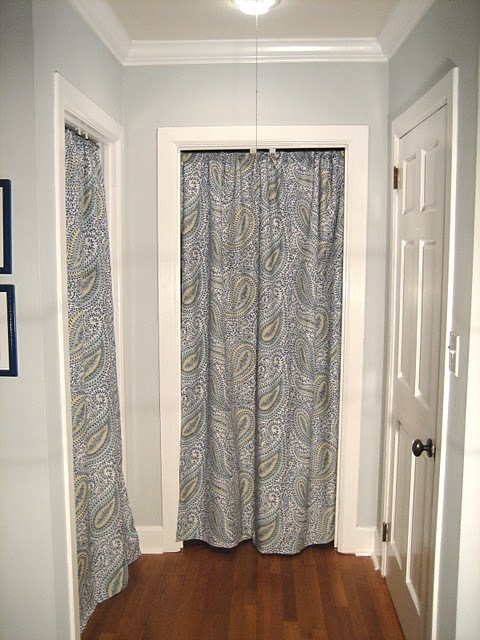 Last summer, I replaced the doors with some DIY fabric panels (read about how I made those here) which match the curtains I made for our windows. That brought instant flow to the room. Fast forward to last week, when we decided that we finally had to tackle the space inside the closet. bedroom, instead of just a small, closed off space. including hanging racks, canvas bins, and shoes racks. Here's what our little closet looks like today. On the left side of the closet, we built in two wire shelves and some Ikea sliding bins. David's shirts go all the way back to the back of the closet. My shoes are in a hanging rack on the left next to our hamper. like David's "pocket dump" collection (please tell me I'm not alone in this?! Seriously, what is up with guys and their desire to keep that random matchbook box from a pub they visited six months ago?). I even have some up on the top shelf, holding bulky items that we don't hang, like sweatshirts. The other side of the closet has another hanging shelf (for t-shirts, belts, etc), my tops and an Ikea rack hanging pants and skirts. David's shoes are on a shelf on the floor, also on this side of the closet. Of course, David and I have pared down our closet wardrobe to only the clothes we wear all of the time. Each season, we go through our bins and the rule is: if you didn't wear it last season, it goes to Goodwill. And, truth be told, we've got some of our less used items, such as suit jackets, my cocktail dresses, rain boots, etc. in our larger guest bedroom closet. They're accessible, but not in our "every day" attire. Sure, it's not incredibly glamorous, but it's what we've got! I'd estimate that we made over the entire closet for right at $100. It's clean, organized, pretty and functional- and we are loving it! If you're starting the new year by reorganizing, good luck! As always, email me any of your favorite home reorganization tips or posts that you've done! And happy 2011 everyone! You did a great job maximizing the space you have. We have a ranch about the same age as you, and there are definitely some challenges. would you believe me if i told you you actually have tons more closet space than us! you do... ours are horrible and poorly planned. maybe one day i will fix them up... it is a project i DREAD. yours looks wonderful!!! and your house is adorable- our first house was a rancher and i loved it! of course it also had a huge walkin closet i loved in our room and sawyer's room. Ahhh, to my organizer's brain, this is the most beautiful sight on Earth. It looks great!!! Looks great Michelle. Thank you for stopping by my blog. I love the items you chose for the closet. I like the drop down baskets and the slide out ones!! Very nice. Great Job! We recently updated our closet too, thank you IKEA. Hope to post about it soon. It looks great! I love the feeling of organization!! Love your blog! Oooh, Michelle! Looks like a dream. Your post title caught my attention because our house was built in 1922 and, yes, we have itsy bitsy closets, too. Love what you've done. It's so organized and functional. Way to start off 2011! Happy New Year! Michelle . . . it looks awesome. Isn't it wonderful to look in there! I love me a well organized closet. And that fabric is so beautiful. I am a huge fan. Well done my friend. Wow, it looks amazing! You guys did a great job getting things organized. And my husband has a box for his "pocket dump" too. It is a must! Thanks for making me feel really awful about my own closet organization. ;) Yeah, that's one of my resolutions this year. Blech. It looks great! Awesome job utilizing all the space you have! Happy New Year! I love the look of curtains as a door. I'm so tempted to do this for some of our closets but with 2 sets of nosey little hands, I might have to wait a little bit. =) They look gorgeous! Coming over from Met Monday and a happy new follower! Looks amazing! And love the look of your blog...happy I found it! Looks lovely! I really like the curtain panels! Adds a little touch of feminine to your space! Beautiful! Whew! I had some catching up to do over here. I haven't found balance yet. Your closet is great...love the canvas bins and fabric panels! Ohmygosh your bathroom is SERIOUS diy, and going to be fabulous. Can't wait to see it come together!! Awesome work! That's my current project, too. Beautiful little closet! Love it! Will you come organize my closet? It is awesome! I want one of those Ikea pants racks you have! Amazing! I follow your rule too! If we didn't wear it ... it goes to GW. Wow, way to organize! Great ideas in there, tons for me to copy. :) Love the curtains, too! I know it's kind of a "little thing," but the curtains are my favorite part! So beautiful, and they add a real softness.